We're posting early so that our global friends can post at a decent hour around the world. So welcome to SEPIA SCENES for October 28/29/2009. I took photographs of a couple of beautiful red roses this past weekend. The day was rainy so the roses were dripping in raindrops. 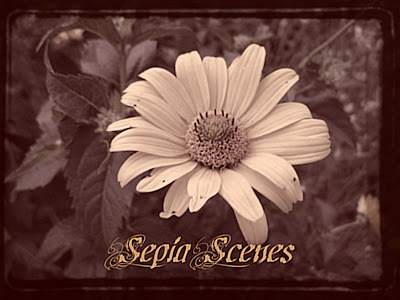 I used Adobe Photoshop 7 to create both these sepia effects. I used regular Variations on the top photo and modified the color to enhance the raindrops. I used Curves to enhance the bronzing effect of the bottom photo. Please sign Mr. Linky and leave a comment. There'll be pleasant surprises for you if you go around and visit some of the other participants. Senor Linky no esta aqui. Pero mi posta esta aqui! Nice work on the roses. they're one of the few flowers that work well in monochrome. Mary, this is the first sepia post before work! The wrinkles of this rose in sepia are so well defined in this monochrome! I like what you've done with roses mary. Mine is up. They're beautiful, Mary. I still haven't learned how to use Photoshop properly but every time I see your work I wish I did. The roses are just perfect. I appreciate that you explain how the photoshop work is done. A novice like me needs a lot of education, as well as trial and error. Thanks once again for an inspiring meme. Roses fits well in sepia. I like the raindrops om them. Nice work. I love roses, the sepia treatment sure brings out the details in these Mary. Nice job. I just love sepia roses. They always remind me of an old play by Tennessee Williams, The Glass Menagerie. So beautiful! And the water drops are so distinctive on the second photo! They were RED rose? You could have fooled me! The second rose looks a lot like a rose I kept for years because a special someone gave it to me. Ha! It's long gone now, though! 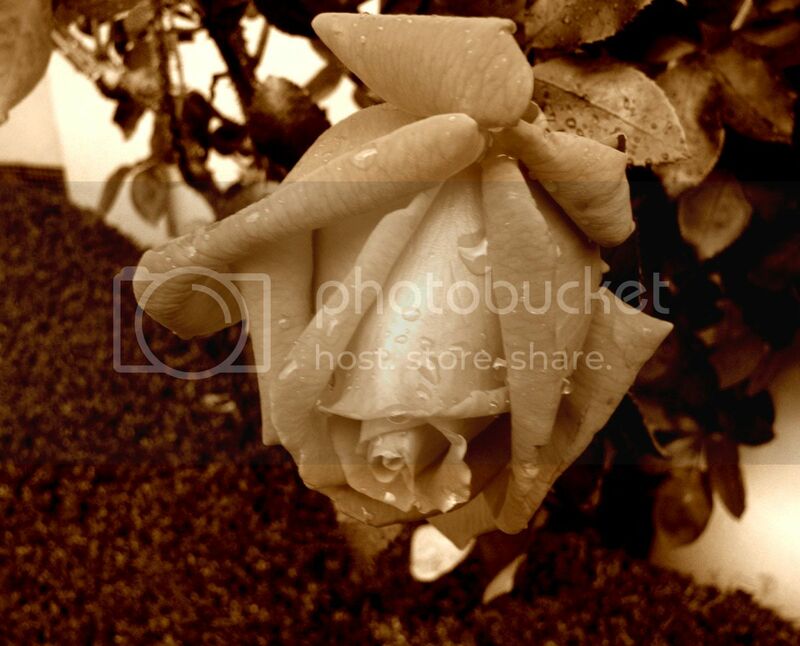 Love the roses in sepia! A lovely rose that is only enhanced by your sepia work. Thanks for hosting this meme, Mary ~ I just visited your Shadow Shot. Running behind. P.S. Like your Jack o' lantern header. Just noticed it. Roses - classic in any color. The tones and details are amazing! I love the roses. I like the second one best. The roses look a little droopy from all that rain. They look awesome in sepia, lends a little mystery to the picture. Have a great day!! just thought I'd thank you for the visit and the clever little rhyme. happy halloween! Love the roses in sepia - makes them look classic! I'd been fooling around with pumpkins my boys carved and then I saw your header..fantastic! Hey Mary, I love the roses, they are so beautiful. I used to love misting all of my bouquets when I worked at a flower shop. It really adds just the right touch. 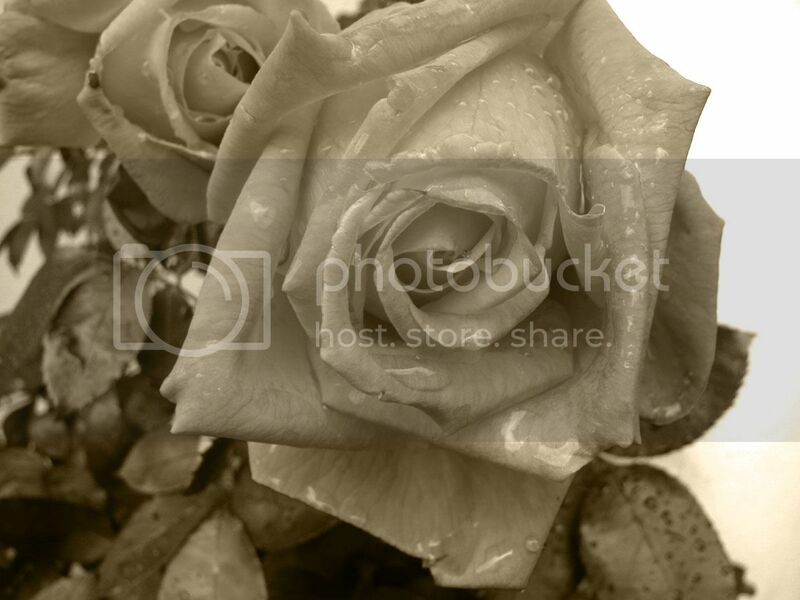 These roses look fantastic with the sepia tone, very nice pictures. Thanks so much for stopping by and visiting me. I haven't been on the computer in a few days with Halloween and all so I'm sorry it took me so long to come back for a visit! I came by to see what you were up to but my name must have slipped into Mr Linky unseen to me cuz I didn't put it there. Sorry! I'm just not memeing these days, got a lot on my plate. I do miss you guys. Sorry, I linked and it didn't show so I did it a few minutes later and then my original showed..